Expect more wind and more cold. Commuters arrive at South Station in Boston in single digit temperatures. The cold weather goes on. I see a bit of a relaxing of the extreme cold — but there’s an even colder shot of air coming for the weekend. Unless you’re 100 years old, after tomorrow you’ll be able to say you lived through the longest stretch of sub-20-degree days since records started in Boston in 1872. We haven’t broken any low temperature records, but the depth and length of the cold is noteworthy and probably making you feel housebound. These are the 10 longest stretches in Boston when the high temperatures did not rise to 20F. Records date back to March 1, 1872. New Year’s Day marked the sixth consecutive day in Boston where the high did not break 20. The record will be tied Tuesday. The dry, cold weather hasn’t yielded much snow, besides some over the outer part of the Cape the past couple of days. That could be changing, though. 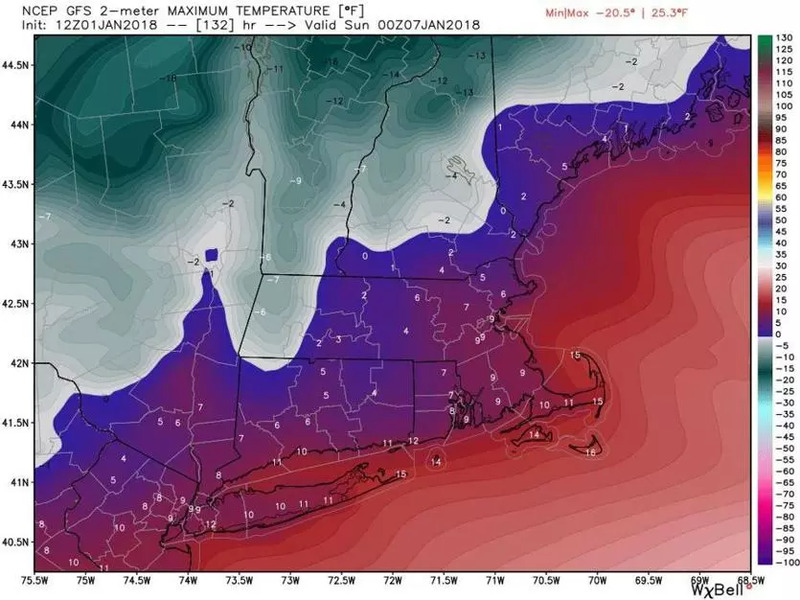 In order to get a major storm, we’ll need some energy in the upper levels of the atmosphere to mix this very cold air with the relatively warm air and moisture over the Atlantic Ocean. That will happen later this week, but it looks like the storm will stay far enough out to sea to spare us a major event. This storm hasn’t developed, yet it’s forecast to become a meteorological bomb undergoing rapid intensification known as bombogenesis. Winds around the storm’s center could near hurricane strength. This is not the type of storm we want. It could result in major coastal damage, widespread power outages, and travel disruptions for days if it hits us head on. Because the storm is so large, the snow shield on the western fringe will brush the area on Thursday. We could see anywhere from a coating to several inches of snow, and the need to bring out the plows. Even with the storm far out to sea, there is still the potential for strong winds and coastal flooding. As the storm heads up into the Canadian maritimes, it will pull down another Arctic air mass, bringing with it more wind and more cold Friday and Saturday. It’s likely that this will be the worst of the winter. When we look back at the season, I suspect Friday and Saturday will end up as the pinnacle of the cold. 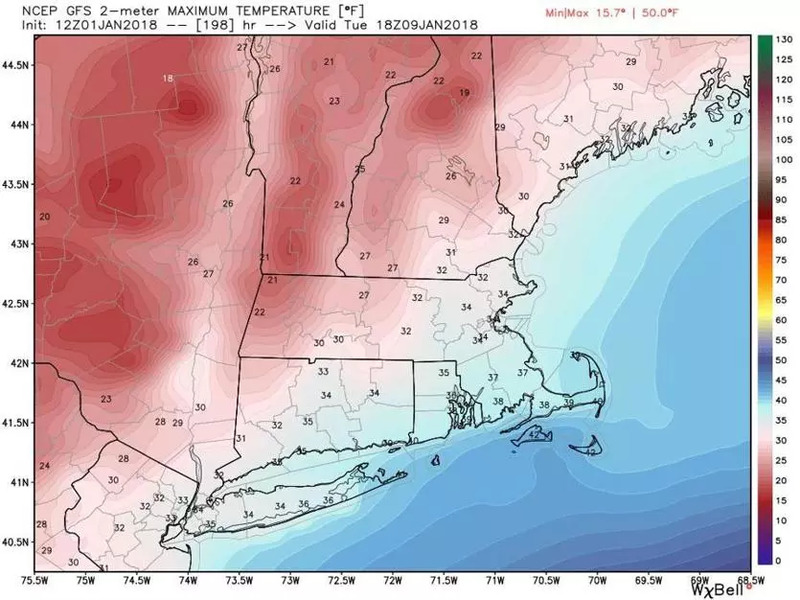 Temperatures on Saturday may not break 10 degrees, even in Boston. It likely will remain below zero not too far to the north and west. The last time it did not reach 10 degrees in Boston was January 2004. That month we saw a very cold stretch in the middle of the month, with the low well below zero three days in a row. You’re wondering when this all breaks. Sarcastically I could say April, but in reality we’ll likely break freezing — at least for a day, maybe more — early next week.